Often called the "hedgehog mushroom," Hydnum repandum is easily recognized by its pale orange-tan colors, its terrestrial habitat, and the spines or "teeth" on its underside. Over the years mycologists have suspected a relationship between Hydnum repandum (sometimes named Dentinum repandum) and the chanterelles. In fact the hedgehog mushroom is easily mistaken for a faded chanterelle--until you get a peek at its spiny underside. 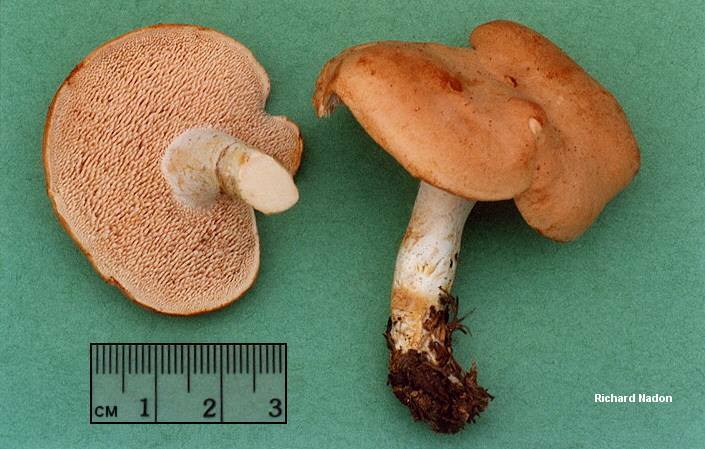 Aside from appearance, taste, and smell, however, the hedgehog parallels the chanterelles microscopically, since it has stichobasidia (basidia whose cell division occurs lengthwise). I am not aware of any DNA research confirming the relationship, though I suspect it has been published, since the current Dictionary of the Fungi places the Hydnaceae within the Cantharellales. Dentinum repandum is a synonym. Varieties and similar species: var. macrosporum has, you guessed it, larger spores; H. albomagnum is southern in distribution and has a mild taste; H. albidum is also southern, has smaller spores, and tastes acrid. Ecology: Mycorrhizal with hardwoods or conifers; growing alone or gregariously; summer and fall; widely distributed in North America. Cap: 2-17 cm wide; broadly convex, becoming flat with a central depression; the margin inrolled at first, eventually wavy and reminiscent of Cantharellus cibarius; dry; fairly smooth; dull orange-tan or paler. Undersurface: Running down the stem; covered with spines or "teeth" that are 2-7 mm long; pale or dull orange; bruising dark orange or yellowish brown. Stem: 3-10 cm long; 1-3 cm thick; sometimes somewhat off-center; dry; smooth; whitish or colored like the cap; bruising brownish. Flesh: Whitish; often discoloring yellowish when exposed or bruised; sometimes with zones of color; brittle. Taste: Mild or peppery; odor mild. Microscopic Features: Spores 6.5-9 x 5.5-8 µ; broadly elliptical or almost round; smooth. REFERENCES: (Linnaeus) Fries, 1821. (Smith, 1949; Smith, Smith & Weber, 1981; Arora, 1986; Phillips, 1991/2005; Lincoff, 1992; Persson, 1997.) Herb. Kuo 09289621, 02200307. Stem: Less than 1 cm wide. Spores: Larger, more elliptical (7.5-9 x 6-7.5 µ).